Trojan batteries are among the best golf cart batteries on the market today. Their cutting edge technology provides higher total energy output when compared to competitors and allows for maximized sustained performance. Trojan batteries have longer battery life, extremely reliable performance, and faster charge times. Having a Trojan battery installed in your golf cart can completely change your experience. Powerful, reliable batteries can make all the difference in an enjoyable cart experience, or one that ends with you stuck in the middle of the golf course or neighborhood. Choosing to go with a Trojan battery is the smart move for your golf cart! At Go With Garrett's, all of our golf carts use Trojan brand batteries to provide you with the best and most reliable ride possible. We can also install new Trojan batteries in your old golf cart. Just give us a call at (843) 881-8894 for our Charleston location, or (864) 862-7709 for Greenville. You can also connect with us online to talk any of your battery or golf cart needs! 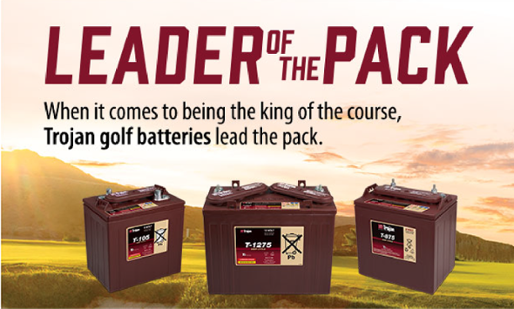 Want to learn more about the advantage Trojan batteries provide? Just fill out the form below and we'll contact you with everything you need to know about superior battery life, performance, and durability.